Give yourself extra peace of mind by having a Genuine Toyota security system or glass break sensors professionally installed at Tuscaloosa Toyota in Alabama ‐ serving Birmingham, Columbus, and Jasper. 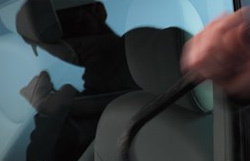 The Toyota Glass Breakage Sensor works in tandem with the Factory Security and Smart Key Systems to offer an additional layer of safety to your traveling, even if you're not in the vehicle. A highly sensitive microphone is used to identify the exact sound frequency of breaking glass, as well as the sounds of objects striking glass. It will emit a "warn-away" alarm sound if windows are struck, elevating to a full alarm if windows are actually broken. 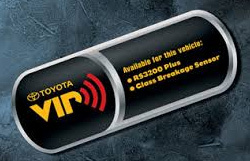 When you integrate your Toyota with the Vehicle Intrusion Protection (VIP) Security System, it becomes nearly impossible to steal. The system works with a highly sensitive panic alarm that emits a loud, attention-grabbing note when activated. The system also features automatic rearming, a door ajar warning, interior lights activation, rolling code technology, and start disabling that renders the vehicle motionless.